The Gamma Knife sends precise radiation beams to targets in the brain that respond to radiation treatment. The Leksell Gamma Knife isn't a knife at all. It was developed by a Swedish neurosurgeon who wanted to emphasize surgical precision in its delivery of gamma rays. As a state-of-the-art piece of equipment it allows a consultant to direct radiation beams to specific areas within a patient's head without making an incision. It allows day case treatments with fewer complications. Its precision and non-invasive nature means it can treat tumours in areas previously considered inoperable due to the high risk of surgical complications. In this video, Mr Ian Sabin explains how Gamma Knife works and what treatments it can be used to treat at The London Gamma Knife Centre. Despite its name, no incisions are made. There are none of the complications associated with surgery. More than 85% of tumours treated do not return. Over 2,800 scientific articles have been published on Gamma Knife radiosurgery, and more than 1 million patients have been treated worldwide, of which more than 250,000 have been treated for brain metastases. Leksell Gamma Knife is known for delivering radiation with submillimetre accuracy, precisely to the unique contours of the tumour while minimising radiation to surrounding healthy tissue. Gamma Knife radiosurgery can be used to treat metastases located in areas that cannot safely be reached by traditional surgery, such as the brainstem. Unlike conventional radiation therapy, which requires treatment over multiple days or weeks, Leksell Gamma Knife delivers a high dose of radiation to one or more brain tumours during a single treatment session, in one day. If the tumour being treated is too large for single fraction radiation, it is also possible to stage the treatment in three fractions at 2 weekly intervals. Most patients can leave the hospital the same day or the day after treatment and resume normal activities in a day or two. Therefore, recovery time and time spent in hospital is kept to a minimum. As radiation is delivered specifically to the tumour, there is a reduced risk of a negative impact on brain function. Some people may experience headaches just after treatment. An aluminium frame is fitted to your head, applied under local anaesthetic. For some patients a mask will be used rather than a frame. You’ll have an MRI scan to outline the area requiring treatment. For some blood vessel malformations (AVMs), a blood vessel X-ray is also needed (cerebral angiogram). You’ll then move into the gamma knife, where multiple radiation beams will be delivered. Most treatments require one session, but the procedure may require several hours when frame fitting, scanning, treatment planning, treatment delivery and recovery is taken into account. Most patients return home the same day. You may stay overnight if treatment has been for a vascular malformation. You'll be asked to remove all make-up, hairpieces, dentures, contact lenses and glasses. Underwired bras should not be worn and we also advise that you wear comfortable, loose-fitting clothing that is 100 per cent cotton. A light, early breakfast should not be a problem, we start the day at 8.30am. Due to the frame, you may find it difficult to eat during the day. Like all procedures, there are potential risks or side effects involved with Gamma Knife treatment. Your consultant will explain these to you and you will be able to discuss them before the treatment. A member of the team is likely to contact you before the day of treatment to ensure you have all the information you need before attending. Once the frame is removed, you may notice some bleeding from the pin sites. If so, this stops with pressure for a few minutes. These small wounds may feel sensitive for a few days afterwards. You might have a headache or feel nauseous afterwards. And your consultant may prescribe steroids for you to take after the procedure to help prevent any swelling or inflammation around the area treated with radiation. You'll may be able to return to normal activities - even work - within one to three days. Your consultant will arrange a follow-up appointment to check how you're recovering and to assess how you've responded to treatment. 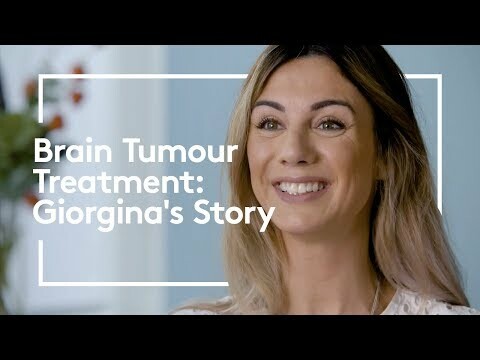 Hear how Gamma knife treated, Giorgina Gray, who suffered from headaches and neck spasms throughout her childhood and teenage years. We're constantly investing in new technology at all our facilities so we can give you the best possible care. The London Gamma Knife Centre at The Wellington Hospital is just one example. Any questions about gamma knife treatment, or would you like to make an appointment? You can call or email us and we'll be happy to help.